As a Pebble watch user, I’m appreciative of watches that do more than show the time and date. The Pebble alerts me to incoming phone calls and text messages from my iPhone. It can also show emails and calendar appointments, although I don’t use those features as the watch would be vibrating too often. But I’m always on the lookout for a better watch, so I was intrigued when I saw the Timex Move x20 advertised as having exercise and sleep tracking, as well as alerts for phone calls and texts. The first surprise was that it is available at Walmart for around $120. In contrast, I had ordered the Pebble from the Pebble website, though it is now available at Future Shop for around $110. 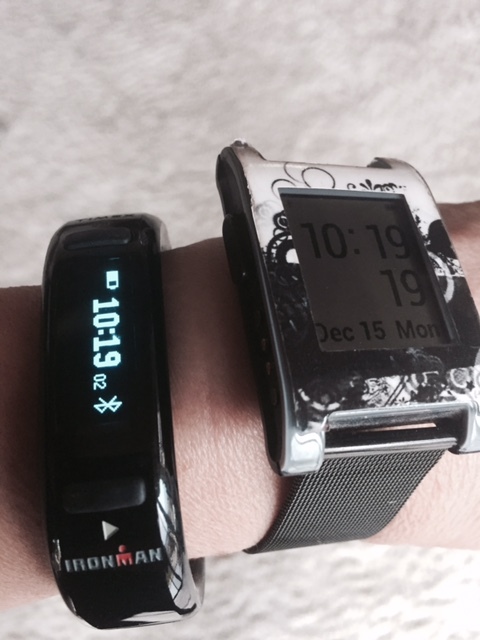 The Timex Move x20 (left) next to the Pebble smart watch. Configuring the Timex Move to work with my iPhone (it also works with Android devices) and setting it up took me about 30 minutes, about the same as the Pebble. The Timex is about half the width of the Pebble and it looks more like a bracelet than the Pebble which tends to look like I’m wearing a small computer on my wrist. The Timex is pretty! And it has some unusual features like individual exercise statistics which I use for my Zumba classes. I just have to remember to start the feature at the beginning of the class and stop it at the end. But there are three major problems with the Timex. The first one is that the phone call and texts don’t always show up on the Timex and when they do, it is for a very short time. I did try to figure out if this is a user definable feature, but it is not. 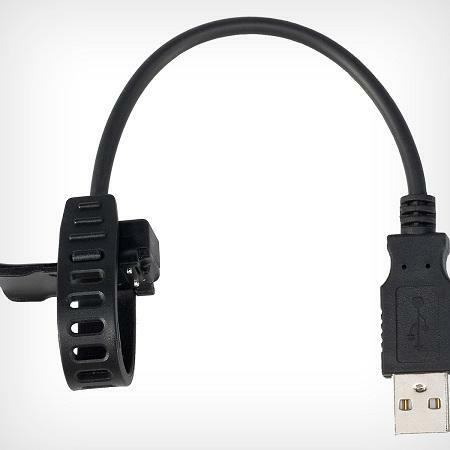 The Timex Move x20 proves awkward to connect with its charger. The second issue I had is charging the watch. The battery lasts for about five days, but then it has to be charged. I found that you almost have to be a contortionist to connect the charger. First you have to place the small protruding lip into the charger, then line up the silver contacts, and finally secure the strap over the watch. The picture below gives a better idea of the tedious connection. I thought that it was just me being clumsy, but my husband and two of my 20-something friends had the same problem. The third issue is that I have to push a button on the Timex just to see the time. Yes the Pebble has some annoying features, but you can see the time and date without pushing any buttons. While the Pebble has many third party software available with a lot of additional functions (stock market alerts, sports scores, fitness applications) many of these have not been tested properly. To be fair, the Pebble has been around longer and had time to fix some of the bugs, so I expect that the Timex issue with not all texts and phone calls showing up will be fixed, but not likely the issues with the charger band. So the Pebble wins this round, but Timex’s entry into the smart watch category may be improved in future generations.